Southern California is a hard place to create community. So when an organization starts to do it successfully, we should take notice. On Monday, Oct. 19, Innovate Pasadena launches Connect Week 2015, a series of events about design, technology, science, and business. Innovate Pasadena is a nonprofit organization that organizes weekly meetups about these topics, and this is the second year that they have expanded their efforts into a weeklong series. Through these and other events, Innovate Pasadena has been successful at nurturing a community of entrepreneurship and enterprise. And a key to the organization’s success is keeping it local. In sprawling Los Angeles county, with its legendary traffic and strained public transportation system, geography is our biggest challenge to meeting and exchanging ideas. Sometimes it’s just too hard to journey across town from Pasadena to attend a meetup in Santa Monica. That’s why the Northeast Los Angeles UX Meetup group exists. Content Strategy Southern California ambitiously aims to reach the content and design community from Santa Barbara to San Diego. But geography is not friendly. We know we have to plan events in Santa Barbara, Irvine, and San Diego, and we are looking at organizing meetups in these locations in the coming year. While many local tech and design hubs exist — Santa Monica, downtown Los Angeles, Pasadena — the content community in the southland is scattered throughout these areas. ESRI, a company that regularly employs content strategists, is located as far east as Redlands. Depending on traffic, getting to Redlands can be a three-hour drive from Venice Beach. Despite the distances, we continue to try to unite the content and design professionals of southern California. On October 21, we will even hold our own event as part of Innovate Pasadena Connect Week 2015. In Transforming User Experience Design with Content Strategy, three content strategy experts will speak about how careful attention to content helps produce better customer experiences. And these three experts are traveling to Pasadena from mid-city Los Angeles, Glendale, and Eagle Rock. It sounds as if New York in the ’70s might have been similar to the meetup culture we’re trying to create today. We meet to discuss theories, markets, movements, strategies. We meet to get the benefits of connection. White calls it “a sense of electricity” — we can call it community. What do you think we should call it? Let’s talk about it. When should we meet? To be honest, there are more than five steps needed for a performance-driven approach to content. A lot more. At the beginning of Information Development World in San Jose on Sept. 30, about 20 content professionals spent a day exploring performance-driven content in a workshop conducted by content strategists Paula L. Land and Kevin P. Nichols. During that day, the team touched on the numerous steps involved in developing a content approach that includes setting goals, measuring progress, and optimizing content based on how well it performs. At the risk of slighting the complexity of the topic, I focus on five highlights. Even if you’re not implementing a complete performance-driven content plan (and almost no one has), these are steps that can probably boost your content efforts. Performance-driven content has its roots in data-driven marketing. In both, we measure how content performs to figure out what to do next. As Nichols explained, we focus on “measurements and evaluation of content in order to make decisions on future content priorities.” And of course starting with effective content sets us up for success. Work with your content team on business requirements. Business requirements are core inputs that go into developing a performance strategy. To gather these requirements, create or identify a content team – for example, the content strategist, copy writer, and product manager. They can act as a de facto governance team throughout the project. Get additional input from stakeholders, and distill the requirements into a project brief. The Content Strategy Alliance published a project brief template you can use. This is one of the more than 40 tools included in The Content Strategy Alliance Tools and Templates: A Best Practices Handbook. Pay attention to the user. Nichols emphasized that a user journey map is the most important user input when developing a performance strategy. “The user journey defines the end-to-end steps the customer takes when interacting with your brand,” he stated. Armed with a user journey, we can create a publishing model that focuses on user needs and content types, as opposed to business silos. Nichols identified eight steps for developing a user journey map. Select the persona you’re charting the journey for. Determine which users complete which tasks. This will provide valuable information about user states, and this data can help when developing personalized content. Identify triggers – the motivation that started the user on her journey. Map channel (web, mobile, app, packaging content, etc.) to each task. Define the content needed for each step and identify what is missing. Test the customer journey with user testing and other validation efforts. As Paula Land explained, in a performance-driven content approach, “constantly monitoring and optimizing content is the goal.” To do this, we need to figure out how much content we have (content inventory) and how good it is (content audit). The Content Strategy Alliance Handbook includes a content audit template with a list of factors to consider when evaluating content. Land stressed that a content audit is not a job for the content strategist alone. The work of auditing should be spread around so that more people in an enterprise can learn the value of content and how improving it is everyone’s business. Once an audit is completed, the team can then plan content improvements and figure out how to make them. This is where governance comes in. Making change, especially with content, often requires organizational change. When talking about governance, Paula Land stated, emphasize benefits, not burdens. Land outlined some processes and tools that can help an organization prepare for and make changes. Develop a team model to support governance. The more team members, the better. Just make sure to define roles and responsibilities. Provide enough documentation so that everyone knows what to do and why. Communicate with the organization regularly. Use governance tools such as editorial calendars, style guides, and dashboards to report tracking data. Throughout the course of the workshop, Land and Nichols examined numerous other details that go into performance-driven content: hard and soft metrics, omnichannel content delivery, and personalization. They’re all great candidates for future blog posts. But for now, I imagine most content strategists have their hands full with these five issues. How are you putting these steps to work? This month brings fresh news about the ongoing contest between San Francisco and Los Angeles. Sadly, Los Angeles is the loser. 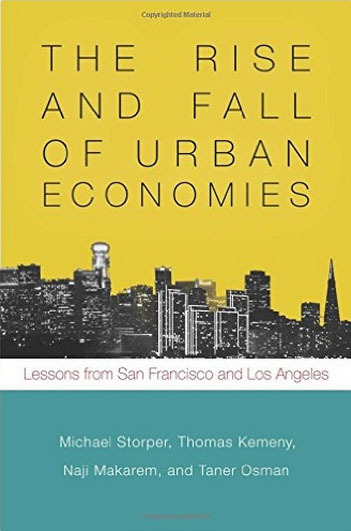 The report comes from a new book, The Rise and Fall of Urban Economies: Lessons From San Francisco and Los Angeles by Michael Storper, Thomas Kemeny, Naji P. Makarem, and Taner Osman. Storper teaches economic sociology and urban planning at UCLA, and he and his team of academics set out to solve a mystery. In 1970, Los Angeles and San Francisco had the same per capita personal income. By 2010, San Francisco’s per capita income outstripped L.A.’s by 30 percent. In those 40 years, what caused this divergence in per capita personal income? As Storper and his team explain, the difference persists across all job types. A programmer in San Francisco makes 30 percent more than his Los Angeles peer. A custodian in San Francisco makes 30 percent more than a custodian in L.A.
Storper and his team quickly discount the usual suspects. Immigration? No. Both regions experienced similar growth from immigrants. Expensive housing? No. The study took into account differences in housing costs. Information technology? No. In 1970, IT held a similar place in both economies, representing about 2.7 percent of the region’s economy. But by 2010, IT in San Francisco grew four times. L.A.’s IT industry stayed the same, still about 2.7 percent of the economy. Storper and team cite San Francisco’s “relational infrastructure” as the reason for the difference. San Francisco had/has an infrastructure that encourages collaboration among specialties as well as the sharing of ideas between specialties. Citing XEROX Palo Alto Research Center as an example, northern engineers have been more likely to collaborate with artists, environmentalists, and designers to dream of making computers that were useful and even beautiful. In southern California, engineers generally continued to work with other engineers, usually in the then thriving aerospace industry. As part of their research, Storper and team examined the composition of boards in both regions. The southern California-based companies were served by generally homogeneous boards — for example, all bankers in a financial services company. Northern California boards were more mixed, including not only peers but also leaders from other industries. The relational infrastructure of San Francisco was more conducive to collaboration on ideas that eventually became influential, successful products. The San Francisco zeitgeist also encouraged innovation. Storper and his team analyzed the content of civic and business communications over the 40 years of the study. From 1979 onward, the Bay area was focused on the “New Economy.” During the same time, Los Angelenos hardly mentioned the New Economy at all. What about the creativity of Hollywood? Storper explains that the entertainment industry remained and remains closed, insular. The cross-pollination of ideas from creative innovators and technical experts is far more likely to happen in Emeryville than Culver City. Yes, Los Angeles boosters deny many of Storper and team’s findings. They don’t seem to take into account the progress of Silicon Alley, for instance. And what about the northern-based companies (Google, Netflix, Yahoo, and so on) who also have a strong presence in the south? And is personal income the only measure of the livability or success of a region? Despite these questions, for designers and content strategists — professionals whose work depends on cross-disciplinary collaboration — this research is alarming. Maybe L.A.’s not cut out for the melding of technology and creativity that our products and projects need. I don’t believe that. But I do believe we have to work harder to make the technical and human connections that lead us — and our city — to success. 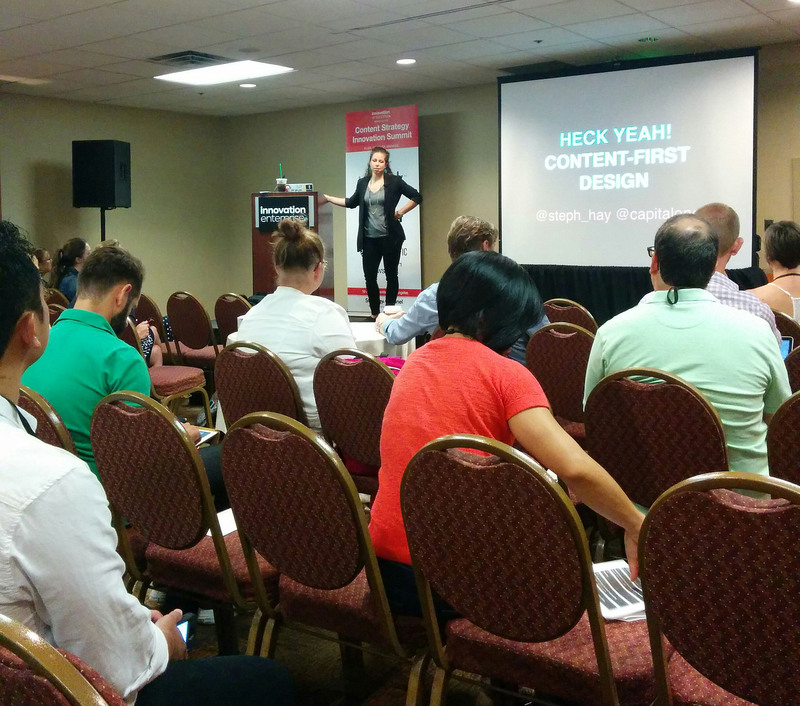 When Content Strategy Innovation Summit attendees returned to downtown Los Angeles on Sept. 11 for the meeting’s second day, they were treated to a spirited defense of designing with content first. 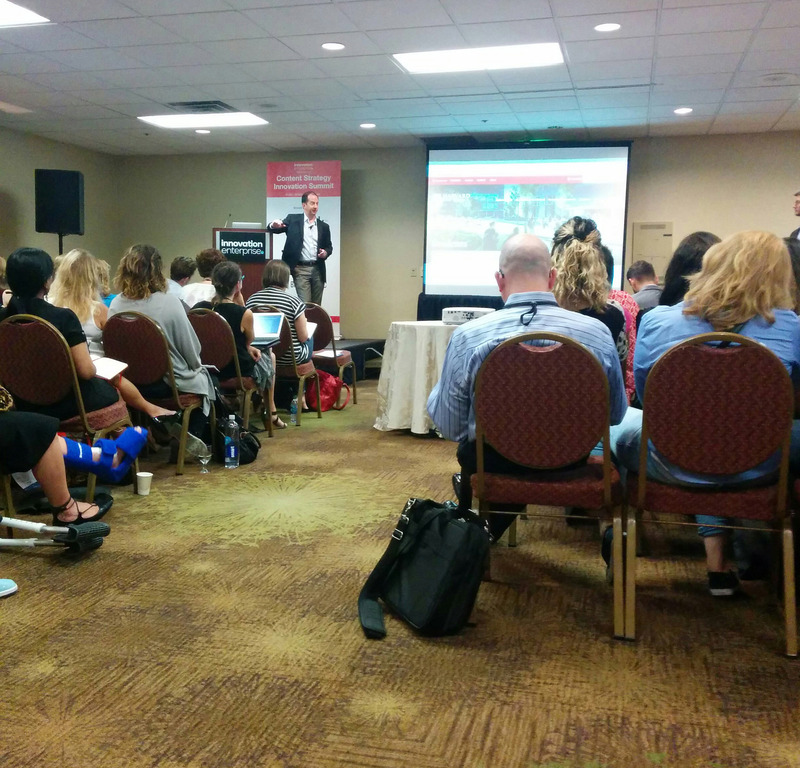 The content strategy and marketing sessions throughout the rest of the day focused on progress in academia, healthcare, and content marketing. Heck yeah! Stephanie Hay advocates for the content-first approach to design. Hay has been making inroads at financial services company Capital One and in the content strategy community as a whole by making the case for designing digital experiences with content first. Hay calls this approach “content iterative design,” and she explains that it’s the lowest risk way to create new digital products and features. Many of the iterations can be done collaboratively and inexpensively in tools such as Google docs or Microsoft Word. Hay draws inspiration for content-first approaches from the world of gaming, where experiences such as registration and onboarding are often done in a conversational, fun way. With a few reasonable adjustments, why shouldn’t the same approach work for financial services? Like game designers, content creators need to “nail the story first” – understand “what the hero really needs to win,” or, in user-experience speak, what the customer needs to accomplish. Getting the hero/customer there depends on clear, conversational copy first, before sophisticated visual designs or interactions. “Design [write] for discovery” is Hay’s next piece of advice. As we lead customers to the next step of success, allow them to discover what they need to do as part of the process. Don’t overwhelm them with instructions. The design and content should guide them along almost effortlessly. Hay and her team of content strategists use this content-first approach with product owners and technology partners, and the effort helps them create minimum viable products quickly. Hay cites other benefits: faster approvals, rapid testing, smooth product launches, and a higher level of engagement in content and design across the organization. In other words, Hay has almost everyone doing content-first design. Hundreds of content creators contribute to the hundreds of web sites of Johns Hopkins Medicine in Baltimore, Maryland. Jesner and Watkins shared their story of gently bringing these diverse contributors into alignment on a unified digital platform. Like Keith McCluskey of Harvard Law School, Jesner and Watkins face the problems of content governance in academia, where everyone is an expert and the publish/perish mindset has a heavy influence on content creation. As Jesner and Watkins explained, they were able to tap into their organization’s unique culture of kindness and care to open the door for successful content governance. Early on, Jesner and Watkins realized that talking about core governance tools such as standards and guidelines would be met with resistance. They reframed the conversation as educators. They spoke to educator-leaders as peers, tapping into the learning culture to start conversations about consistency and innovation. After establishing trust in their audience, Jesner and Watkins began talking about customer goals and brought data from interviews, focus groups, and Foresee surveys to the table. Jesner and Watkins established a pattern of success and shared postive metrics such as improved search rankings and better patient/customer experiences. Now they count some of those experts as their advocates. In content marketing, a content strategy is at the intersection of what a brand wants, what customers are interested in, and market opportunities. Throughout the summit, a number of speakers focused on content strategy in content marketing, the art and science of getting branded content onto consumers’ screens. Representatives from companies such as Twitter, Tenet Partners, the Economist, and Contently spoke about the unique content and data challenges in this field. Because my focus is UX content strategy, many of these sessions are not immediately applicable to my work. But this Contently slide rang a bell. It places content strategy at the center of business goals, audience interests, and market opportunities. For UX content strategy, we can draw a similar Venn diagram that places content strategy at the center of business goals, user needs, and product development. I’ve also seen a Venn diagram that places content strategy in the center of visual design, interaction design, and technology. 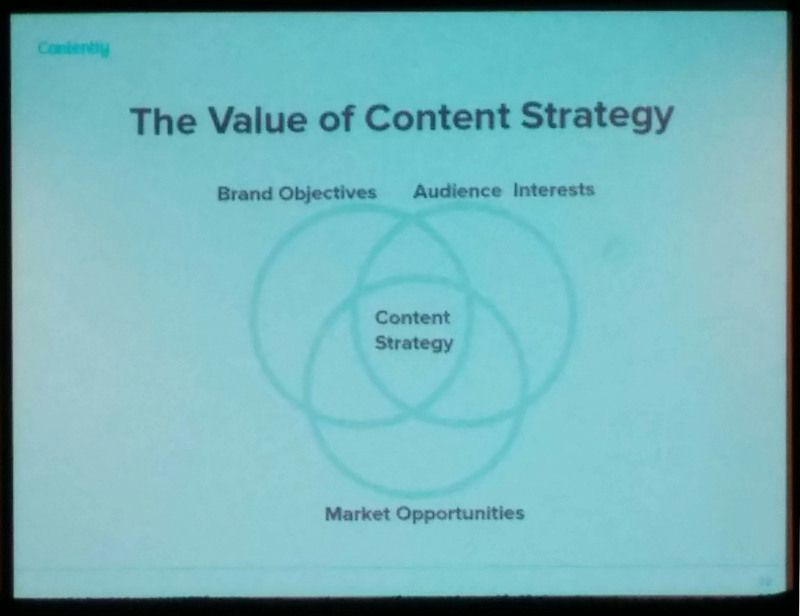 In all versions, content strategy remains in the center. In both marketing and UX content, the content strategist looks in all directions, bridges teams and gaps, and makes sure the entire effort keeps moving forward. On Thursday, Sept. 10, about 100 content strategists and content marketers gathered in downtown Los Angeles for the Content Strategy Innovation Summit. Here are select highlights from the day’s sessions. Lafargue has been involved in Google Apps for business projects, and she argues that the key to effective content in these products is authenticity. How to achieve it? Define your core; know your brand and what it stands for. Decide who is NOT your audience. This can help focus product and content efforts. Bring a piece of yourself to the content you create. Keith McClusky delivers an update on Harvard Law School’s online strategy. Listening: Seek out and share best practices and other information with industry peers. Starting small: After being denied the full budget for a redesign effort, begin with a pilot project that is less expensive and will show the value of stronger content design and strategy. Getting buy-in: Develop an online strategy committee that unifies deans and other stakeholders, especially the ones who might throw up roadblocks. Scrum: Tap into the Agile methodology to create a list of tasks that can then be prioritized. Be honest about what works, and be open to surprises. In their work, Cooper and Campbell focus on how content can incite emotion, change behavior, and shape experiences. They drew on literary examples to show how thoughtful writing can be integrated into a user experience to help users feel that they belong to a unique, safe community. I learned something in a recent experience with Netflix. In content, we don’t want just brevity, clarity, efficiency, or effectiveness. What we really want is beauty. We seldom really know what customers want. I was reminded of this when rereading Karen McGrane’s Content Strategy for Mobile. She chides the digital community for creating substandard mobile experiences because we think we know enough about the customer’s context. The customer is on a mobile phone, we reason; she can’t possibly need to research her family’s vacation or buy a car or get information about a critical medical condition. So we don’t do the design and content work of creating those experiences. Sadly, we reason wrong. We choose not to deliver content the customer needs. Delivering content on mobile [is] … a necessity. It isn’t a luxury. It’s a requirement. Do people want to look it up? They’ll want to look it up on mobile. Do people need to search for it? They’ll want to search for it on mobile. Do people want to read it, deeply and fully? They’ll expect to read it on mobile. Do they need to fill it out, document it, and enter it into the system? They’ll need to do it on mobile. Think of any piece of information people may want to access on the internet. They will need to access it on a device that isn’t a desktop website. It’s easier for us, the digital designers and content managers, to assume that customers don’t need certain content because they’re viewing a smaller screen. It makes our jobs easier – responsive or adaptive content is hard work. But this is important work we need to be taking on now to lay the foundation for the satisfying, even delightful experiences we want to deliver in the future. Before we get there, we need more analytics, research, and insight. We need to know a lot more about our customers before we commit them to any experience. In a recent Contently post about digital media, Dillon Baker writes that “with mobile’s rapid rise to dominance, it turns out people are spending a ton more time with every screen – or at least every screen besides TV” (“The Digital Media Boom, in One Chart,” The Content Strategist, Aug. 20, 2015). My recent Netflix experience confirms this statement. At the end of a day, I found myself lying in bed with a cat on one side of me, the kids finally asleep upstairs, and my iPad on my lap. After a day of tending to and worrying over screens, I was ready to be entertained by another one. 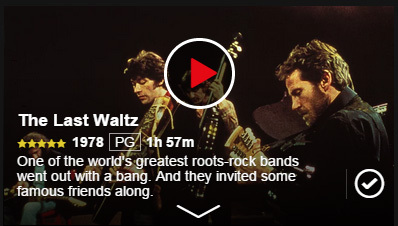 I selected Martin Scorcese’s The Last Waltz from My List and tapped the play icon. In interviews and performances, the film chronicles the last concert of the Band, the influential rock group from the 60s and 70s. I’m not old enough to have been a fan of their music then, but I can’t deny its popularity and power now. Yes, I could have transferred the film to the larger screen TV in that room, but I didn’t dare. I couldn’t risk disturbing the peaceful cat next to me or the sleeping children upstairs. Of course our digital products are a long way from knowing the context that went into my experience. The long day, the cat, the kids, the comfy pillow – my context. Having my devices know all that about me would probably be creepy. But it’s that kind of customer insight and empathy that will help us build the right experiences for any device. I’m writing this in Seattle, where I’m going to deliver a presentation about content strategy for mobile. As I’ll explain in my slides, we are making progress, slowly, toward creating digital products that reflect an informed understanding of our customers. When we get there, we’ll be delighting users in pleasantly surprising ways. We’ll deliver just enough of the right words and media, and that content will be current, accurate, meaningful, useful – in a word, beautiful. Content Strategy Southern California presents Debbie Fellman’s “Content Strategy for Mobile: A Case Study” on August 27 at Epic Spaces Coworking in Pasadena. For more information, visit Content Strategy Southern California on Meetup.com. Want to experience “The Weight” for yourself? Here’s the link on YouTube. Play it loud. What’s in Your Content Strategy Toolkit? It’s a good season for content strategy tools. A coalition of content strategists including Noreen Compton, Paula Land, and Kevin P. Nichols just published The Content Strategy Alliance Tools and Templates: A Best Practices Handbook. With a practical focus on guidelines and documentation, the handbook presents more than 40 tools for content strategy projects, and I’ll review it in a future post. 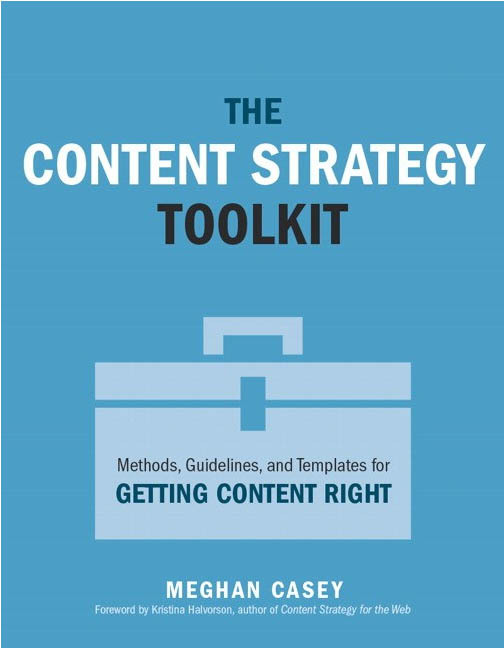 Earlier this summer, the content strategy tools season began with Meghan Casey’s Content Strategy Toolkit: Methods, Guidelines, and Templates for Getting Content Right. Casey is a lead content strategist at Brain Traffic, Kristina Halvorson’s content strategy consulting firm. It comes as no surprise that Casey approaches content strategy from a consultant’s viewpoint, but content strategists embedded in enterprises will also find plenty of valuable insights and useful tools in this essential content strategy resource. What might be surprising about this book is how long it takes to get to the nitty-gritty content strategy stuff. I passed the book to a colleague, and, glancing at the table of contents, she said, “She doesn’t even get to content strategy until chapter eight.” That’s when Casey presents information about the inventories and mapping that many people think of as content strategy. Of course those tasks are critical, but Casey is smart enough to know that a number of other steps need to happen before that work can be effective or even happen at all. That’s why Casey begins her book with two chapters about getting the money and organizational agreement to begin the content strategy project in the first place. Even within a big company, the content project sometimes begins as just a notion about how to make some content improvements. Casey provides guidance into how we can guess at what can be improved, quickly test our hypothesis with an audit and/or user testing, and then document the areas for improvement, which we are advised to call opportunities, not problems. But solving those problems, er, opportunities, takes resources. How do we talk to the money people to get budget and buy-in? Many content strategists may not have the business-budget background, so Casey spells out a straightforward way of turning a discussion of opportunities into budget. Yes, math; she goes there. But in just a few pages, she shows how even the most number-phobic content person can document business risks and compare them to rewards. These are the kind of numbers and discussions that can get content strategy efforts funded. Even before the content strategist can dig in to deliver on the promise of rewards, additional organizational communication and negotiation needs to happen. Casey explains that we need to identify stakeholders, especially the ones who can derail a project. We then need to get them all involved and communicate with them throughout the project. Sounds like project management, doesn’t it? If you’re in a larger organization with a department of skilled project managers, then some of these steps might be their job. If not, Casey explains, then you need to play an active role in running the project and communicating about it. Other steps Casey describes are sometimes product management or research tasks. This emphasizes how collaborative content strategy needs to be. Regardless of who does the work, Casey offers guidelines for how it can be done. The tools you can download with the book are a sound start for accomplishing necessary content tasks and moving the project along. The names, deliverables, and artifacts for this phase in digital projects vary. I’m sure you’ve heard terms such as information architecture (IA), sitemap, wireframe, template, content type, content model, structured content, page outline, component library, and so on. I like to wrap all these items and more into the umbrella term content design. This is a term that is gaining prominence in the user experience design community, and some content strategy professionals have even renamed themselves content designers. The terms Casey lists in that paragraph are certainly becoming expected of more content strategists. 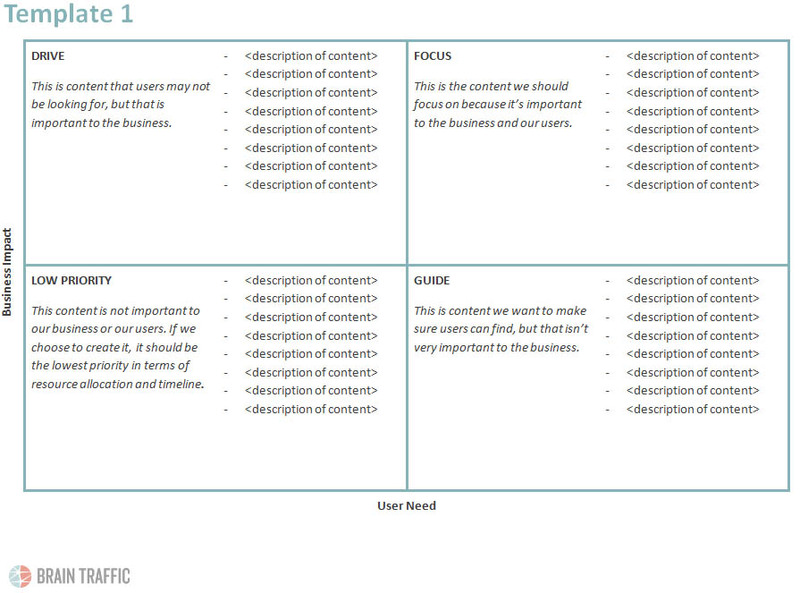 A content prioritization template from The Content Strategy Toolkit. Many of the content strategists I know are deeply involved in these steps. I know I am. It was helpful to hear some of our thoughts reflected and refined in this chapter, and I’m looking forward to putting the tools Casey presents here to work. Other content folks will probably have other favorite chapters and tools, depending on their interests and the needs of the projects they’re working on. I’m sure that’s why many content strategists will be keeping this book near their desk, for guidance about how to get content done at almost any stage of a content strategy project – from initial budget to product launch and into the governance that happens after. This book might not be a definitive toolkit. There will always be some projects that have unique problems (opportunities?) that require a unique approach or deliverable. Casey herself admits that the spreadsheets and presentations and Word docs she offers will often have to be tailored to your clients and companies. But Casey does present thoughtful, business-tested methods, tips, and templates that are a great foundation for any content strategist – knowledge we all should have in our toolkit.